The chance of a lifetime, an “in your wildest dreams”, the opportunity for a seven-year old to sing with his favorite quartet. On September 24th, 2010, Caleb Garms got to sing with the award-winning Legacy Five his renedition of “I’m Feeling Fine”. He wowed Legacy Five and crowd with his young professionalism and growing talent, and received a standing ovation from the enthralled audience. Legacy Five became “Legacy Six” for one song; one little boy was on top of cloud nine for the night; one crowd experienced a piece of history and will never forget it. 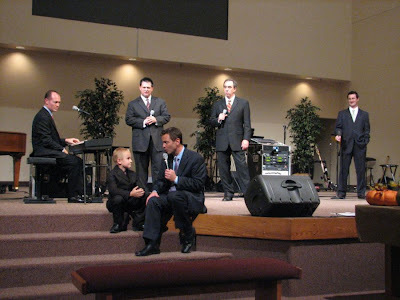 Legacy Five, voted “Favorite Quartet of the Year” in 2004 and 2008, comes annually to Heritage Assembly of God in Baxter, MN since the group’s formation in 2000. The Garms family has been seeing Legacy Five there since 2006 and lovingly calls the special event “The Most Anticipated Night of the Year”. 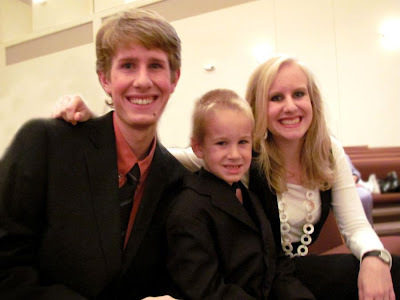 The Garms family loves to sing and make music together for the glory of God, and started the family group, Great Adventure Gospel Band, in 2008. 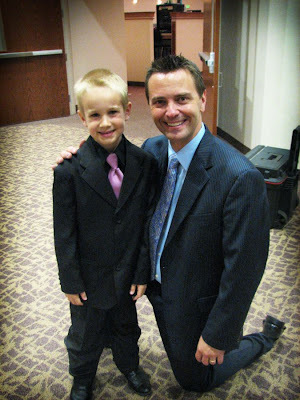 Caleb, the youngest of eight children, has loved Southern Gospel music since he was two years old and is known for his exuberant performance and exciting talent on stage. One of his favorite singers has been Scott Fowler, lead singer of Legacy Five, and he loves to imitate him and many others. The idea was born in the mind of Caleb’s big sister Taylor one day as she thought about the upcoming Legacy Five concert, which the Garms family would be attending, on September 24th. 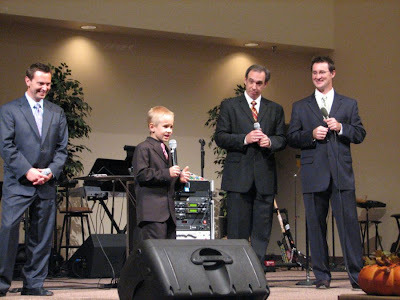 Caleb performs the Southern Gospel classic “I’m Feeling Fine” at their own concerts, and knowing that Legacy Five also sings that song, Taylor began to wonder if they would let Caleb sing with them. She kept this idea a secret (except for later sharing it with her sister Leesha and then Caleb), as she didn’t want anyone to get too excited in case it did not happen. Big siblings, Ben and Taylor, with Caleb before the concert. Three of the Garms kids, Leesha, Sam, and Jayme, fell ill with the chicken pox during the week before the concert, and were not able to attend the concert on the 24th. This brought another hesitation to Taylor’s mind: should she bring up the idea to Legacy Five if the whole family wasn’t there? She decided to try it anyway, knowing they would understand. At Baxter, Taylor shared the idea of Caleb singing with Legacy Five with friend and promoter Bill Holbrook. He then in turn went to Scott Fowler and said, “Want to have some fun tonight?” The rest was history! After the second song during the second half of the concert, Scott called Caleb up and introduced him to the audience. Caleb loved every minute of it and delighted the audience with his entertaining performance. To watch the video of the special moment, click here. Or watch the video below. Thank you Legacy Five for making a dream come true for a young singer. You have been an awesome influence in this seven-year old’s life. Blessings on your ministry! And thanks to Bill Holbrook for being brave enough to share the idea with Scott. 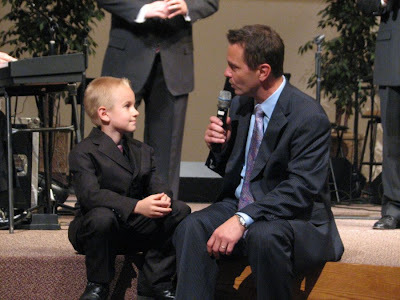 You saw Legacy Six in 2010 when seven-year old Caleb Garms joined Legacy Five for “I’m Feeling Fine” in this video: http://youtu.be/Y4RZtgsAwmE . Legacy Six (with Caleb at eight-years old) returns in 2011 for an encore of “Somebody Sing”! Enjoy! Thanks for sharing, I love you all! Great job, Caleb! Thank you for your encouragement. 🙂 I am so glad you liked it, even though we really aren’t related! i hope that you guys can come and surprise me here in fergus falls mn for my 19th birthday love you guys always love always your guys favorite girl and i could even help with the product table help bring in the product table. you are very welcome.Caleb and i also see that Legacy Five is going to be coming back again this year to Baxter,MN are you guys going to be going to see them again in september.